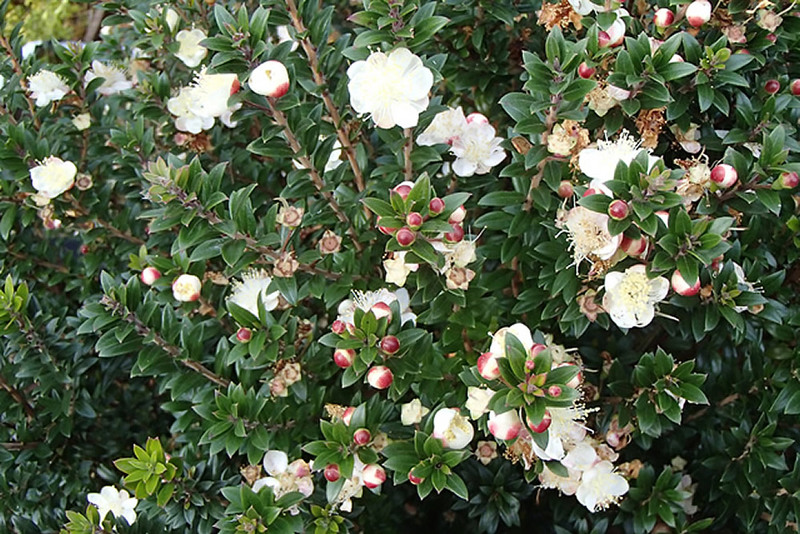 Distribution and habitat: Myrtus communis is native across the northern Mediterranean region. 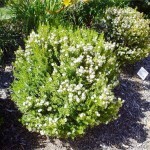 It is a common and widespread shrub and the sole representative of the Myrtaceae in the Mediterranean Basin. 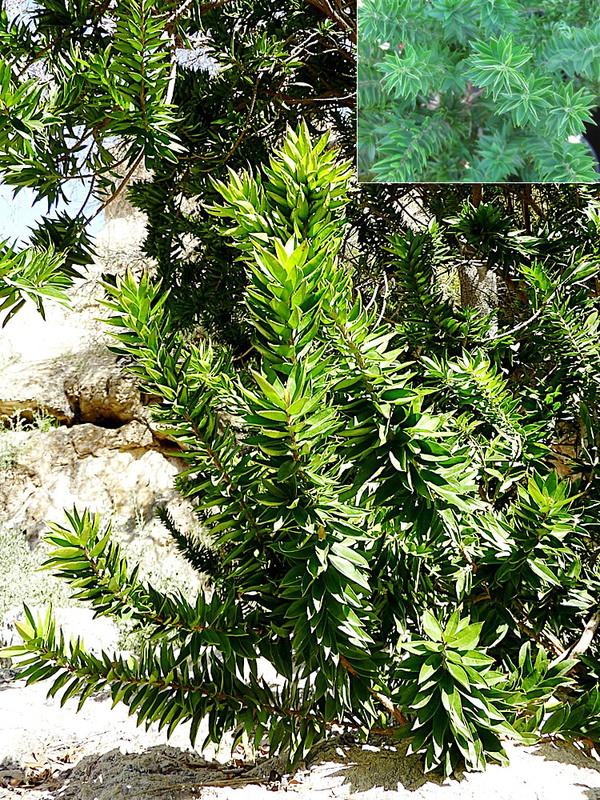 It is typically found in Maquis shrubland together with other low-growing shrubs which have been developed after the clearing of the primary woods of the Mediterranean in the lower mountain environments. Thought to originate from Iran and Afghanistan, Myrtus communis has been cultivated throughout the Mediterranean region since the beginning of recorded history. 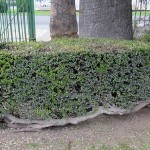 The species type develops an irregular upright oval form, eventually becoming a small tree 4 to 4.5m (12-15 feet) tall in old age; plants are often shorn to maintain a lower profile, say under 1.5 or 2m (5-6 feet); overall plants are fine textured and are reminiscent of the Common Boxwood (Buxus sempervirens) in form. Description: Myrtus communis is an evergreen shrub or small tree, growing 4.5m (15 feet) tall in its native habitat, but usually only 60-90cm (24-35 inch) high indoors. This species is a branching shrub with densely crowded, pointed-oval leaves, which are dark green, shiny and fragrant when crushed. The scented flowers have a diameter of about 1-2cm (0.4-0.8 inch) and are composed of a mass of yellow stamens concealing five small, white or pale pink petals. The flowers are normally produced singly on short flower stalks in late summer. Proper care: Myrtus communis are the most commonly plants of this genus grown as indoor plants. 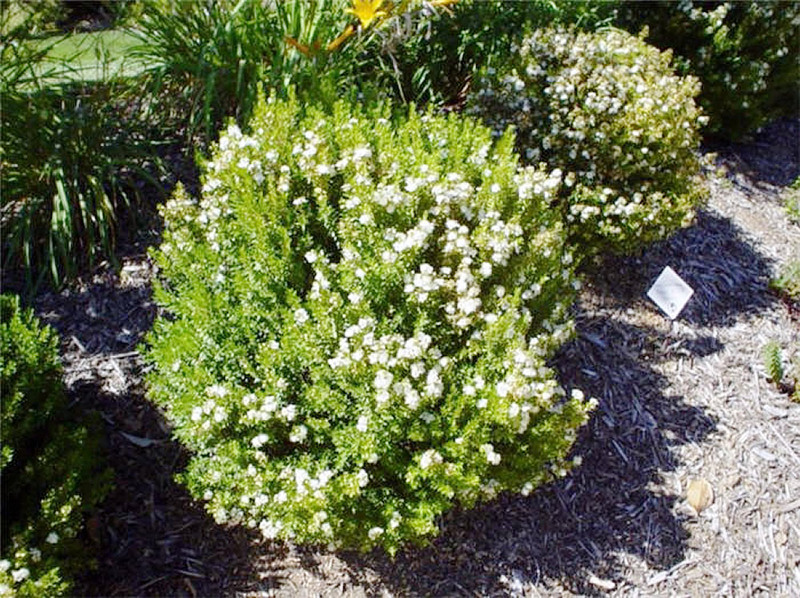 These small shrubs can be easily kept in shape by judicious pruning, which should be done only when strong growing shoots that might otherwise spoil a plant’s symmetry have become apparent. Too much heavy pruning will reduce the likelihood of flowers, but a certain amount of regular pinching out of growing tips is essential for building up healthy, dense growth. Light: Provide Myrtus communis with the brightest possible light at all time. If these plants are placed more than 30-60cm (12-24 inch) away from a fully sunlit window, they become spindly. Turn the plants regularly in order to avoid lop-sided growth and provide airy conditions when they are cultivated indoors. Temperature: Although Myrtus communis prefers relatively cool conditions, it grow well in normal room temperature. If possible, however, give this plant a winter rest period at about 7°C (45°F). Otherwise, the relatively warm, dry air will make the leaves to fall. Fresh air during active growth period will toughen up growth, so these plants may be stood in a sunny position outdoors throughout the summer. They should be gradually accustomed to sunlight because the leaves are not used to ultraviolet rays after spending winter indoors. Also the root ball should not be exposed to direct sunlight. Watering: During the active growth period water plentifully. During the rest period water moderately, giving enough to make the potting mixture moist throughout at each watering but letting the top few centimetres (0.8 inch) of the mixture dry out before watering again. If at all possible, use rainwater or some other calcium-free water. Feeding: Do not feed these plants until they have been lodged in same pot for more than three months. Thereafter, apply to Myrtus communis plants standard liquid fertiliser about once every two weeks during the active growth period only. Potting and repotting: Use a soil based potting mixture with addition of one third portion of leaf mould or peat moss. 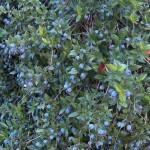 The basic mixture should be lime-free, because myrtus species do best in neutral or slightly acid medium. 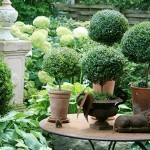 As plant get bigger, move them into increasingly larger pots, one size at a time. This is best done just as new growth is starting in the spring. Young specimens should be repotted every 1 to 2 years, older plants every 3 to 4 years. It is important to pack the potting mixture firmly around the roots and to set these plants at the same level in successive pots – never deeper than before. Once a Myrtus communis is lodged in a pot of maximum convenient size – about 18-20cm (7-8 inch) – simply top dress each spring. Gardening: Myrtus communis species does not succeed outdoors in the colder parts of the world. When fully dormant Myrtus communis is hardy to between -10 and -15°C (14-5°F) as long as it is sheltered from cold drying winds, though it does withstand quite considerable maritime exposure. The young growth in spring can be damaged by late frosts. Myrtus communis is a moderately fast-growing plant when young but soon slowing with age. Overall, the growth is moderate to fairly slow, particularly on the compact cultivars. 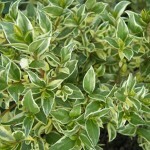 The plant is very tolerant of regular clipping and can be grown as a hedge. Any pruning is best carried out in the spring. Position: Locate Myrtus communis plants in full sun to light shade. These plants are heat, drought and salt tolerant; avoid exposure to winds to reduce winter injury. They cannot grow in the shade. 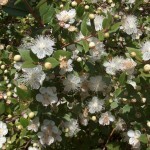 Soil: Myrtus communis succeeds in any reasonably good soil so long as it is well-drained. It prefers a moderately fertile well-drained neutral to alkaline loam. Irrigation: Myrtus communis plants are intolerant of poorly drained soils and high humidity, so they are often planted in raised beds or containers. Follow a regular watering schedule during the first growing season to establish a deep, extensive root system. Established plants do well with one deep irrigation each month in summer. Shallow, frequent irrigation may cause plants to turn yellow. Fertilising: Needs little or no fertilizer. Eventually, use a general purpose fertiliser before new growth begins in spring. Propagation: Cuttings with a short heel (meaning with a little of the old bark attached) are normally used for propagating these plants. The process require patience, since rooting may take six to eight weeks. Inset several cuttings together around the rim of an 8cm (3 inch) pot containing a moistened rooting mixture and enclose the whole in a plastic bag or propagating case. Keep it in medium light – at a slight shaded window for instance – at a temperature of about 15°C (59°F). When new top growth appears, move each rooted cuttings individually into 8cm (3 inch) pots of the recommended potting mixture for adult plants. Thereafter, treat the new specimens as mature plant. 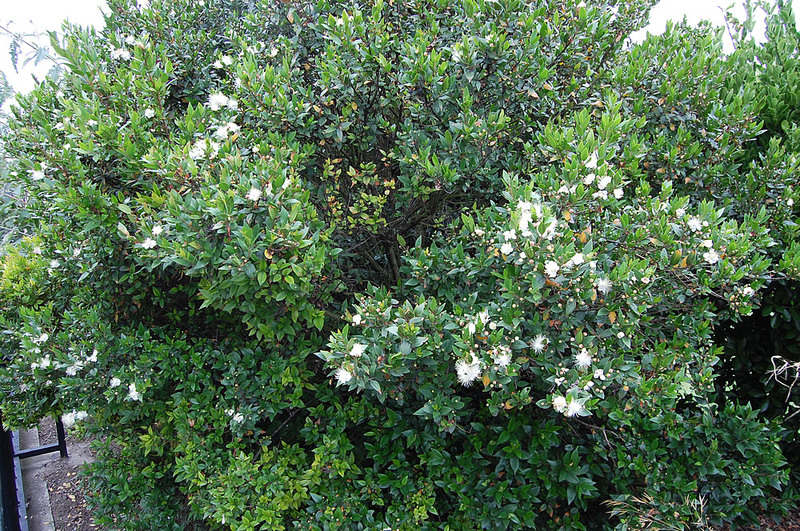 Myrtus communis is prone to infestation by scale insects and subsequently sooty mold may develop; root rots occur on wet soils; thrips and spider mites can attach in hot weather. 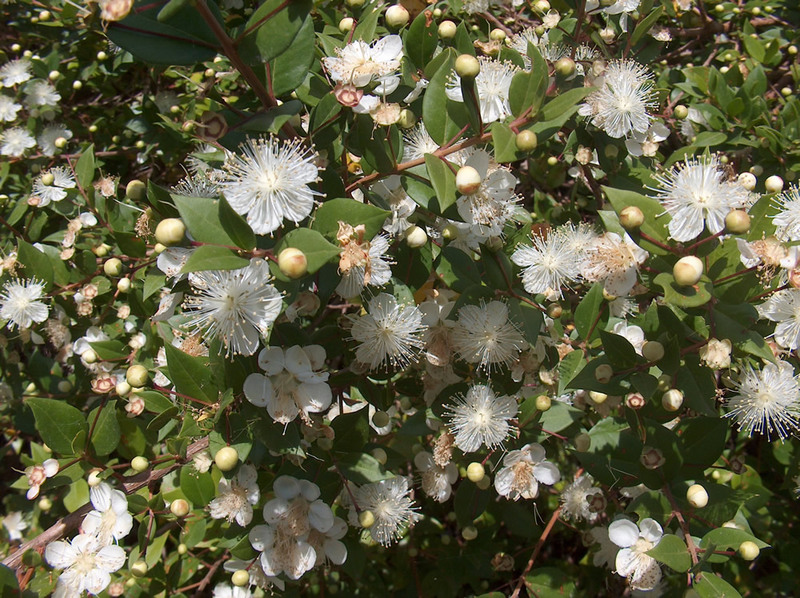 Toxicity: The essential oil contained in the leaves of Myrtus communis plants is slightly toxic. It may cause headaches, nausea, indigestion, and may colour urine purple if consumed in larger quantities (above 10 ml). Myrtus communis cv. ‘Boetica’ (Twisted Myrtle or Desert Myrtle) has leaves about 2-3cm (0.8-1 inch) long which have a pronounced fragrance. Myrtus communis var. 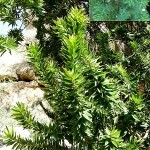 microphylla (Dwarf Myrtle) grows no taller than about 60cm and bears leaves less than 2.5cm (1 inch) long. 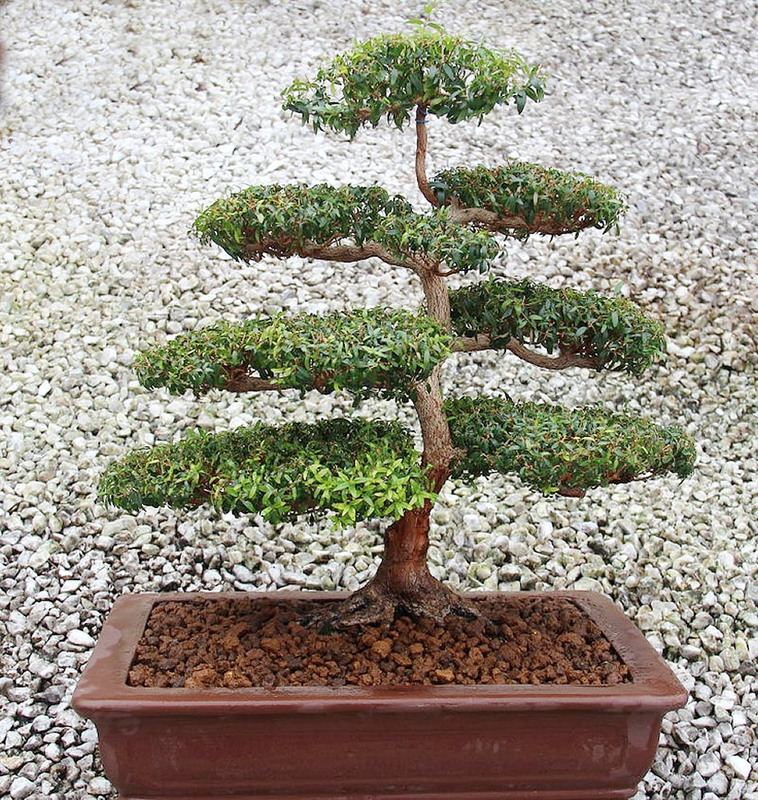 Myrtus communis microphylla can be pruned and trained into practically any shape. Myrtus communis subsp. tarentina is compact and its 2cm (0.8 inch) long leaves are usually tough. More compact and rounded than the species plant, it is a great choice for a sheltered, sunny spot in the garden. 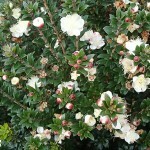 Myrtus communis cv. 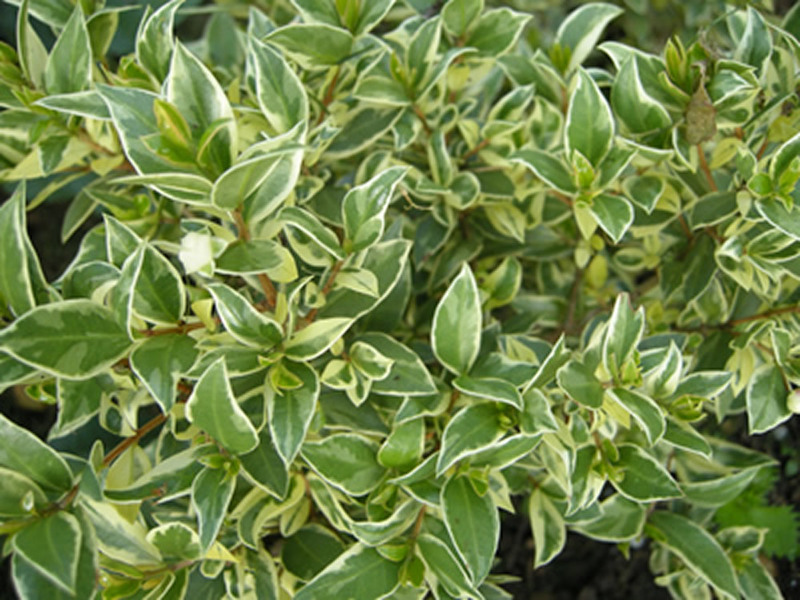 ‘Variegata’ has sharply pointed green leaves bordered with creamy white. Uses and display: Myrtus communis is widely cultivated as an ornamental plant for use as a shrub in gardens and parks. Formal sheared hedges are the principle use for the species; old specimens can be limbed up into small trees. 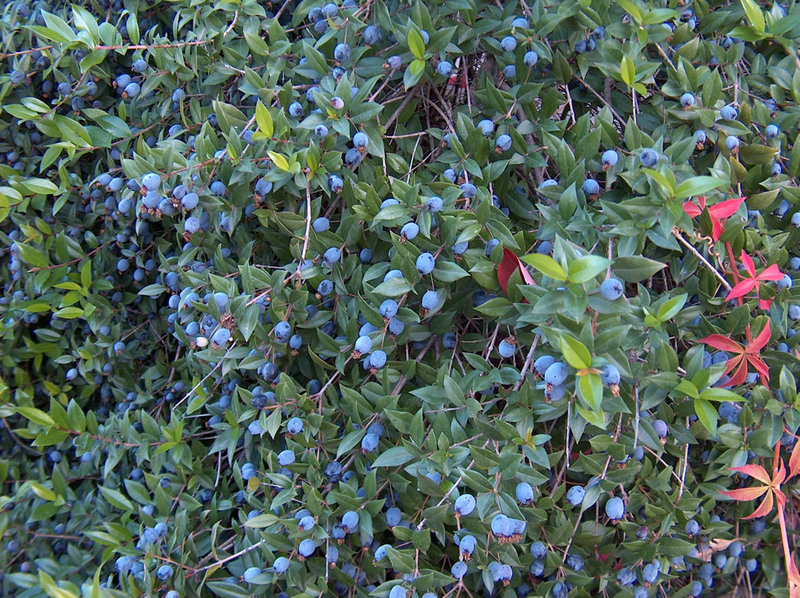 Myrtus communis is excellent for hedges, screens, patio planters and pots or for providing a dark green background for perennial or annual color plantings. It is a classic for Mediterranean gardens and historic, period, scent or educational gardens; compact forms are a favorite for knot garden borders. 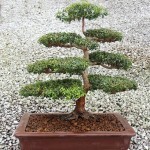 This plant is a favorite of coastal landscapers and works as a bonsai. 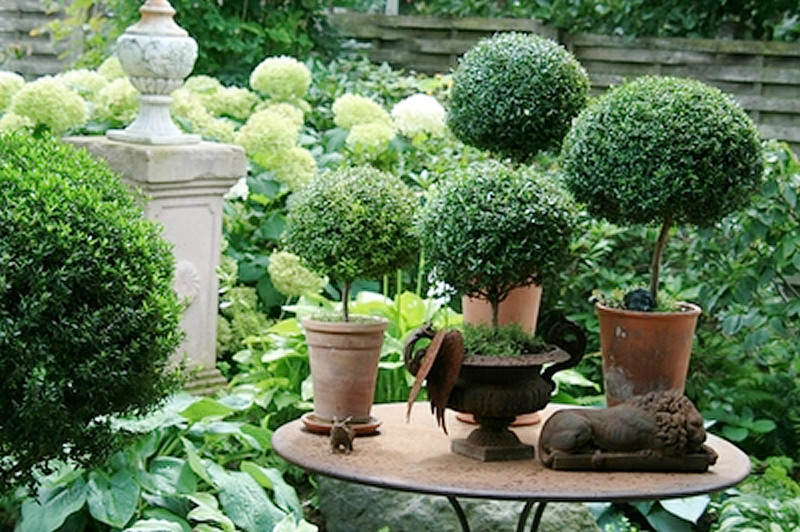 It takes pruning well and is suitable for topiaries. When trimmed less frequently, it has numerous flowers in late summer. It requires a long hot summer to produce its flowers and protection from winter frosts. Myrtus communis is often cultivated in the Mediterranean, where the plant is regarded as a symbol of love and peace and is much prized for use in wedding bouquets. An essential oil from the bark, leaves and flowers is used in perfumery, soaps and skin-care products. An average yield of 10g of oil is obtained from 100 kilos of leaves.